How can I ggplot a logistic function correctly using predict or inv.logit? I have some observations that I have used to determine death rates based various concentrations of a chemical. I have weighted these rates based on the number of observations underlying them, and fit them to a glm (binomial(link=logit)) model. I have been unsuccessfully trying to display a plot of this model in ggplot including original observations (size = weight), model fitting line, and confidence interval, without luck. I can get a simple plot() to work, but then I can't display the other graphics I need. Any ideas? Thanks in advance!!! 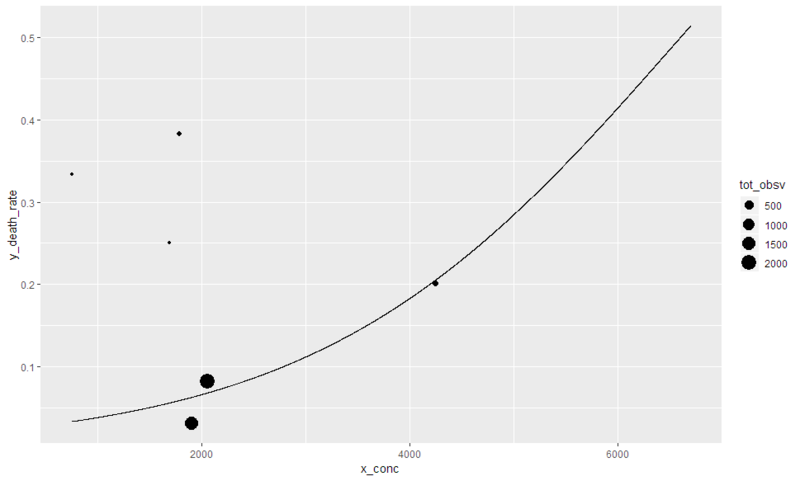 Basically, I am trying to plot the glm predicted logistic curve, observation weights, and confidence interval using ggplot, but can only get the curve to display correctly using plot(). Lumi is a new contributor to this site. Take care in asking for clarification, commenting, and answering. Check out our Code of Conduct. You can include the realized values of the regressor(s) in your predict function, and then add a geom_point using only the data from values realized by the regressor(s). If you use size = tot_obs it will only plot points where that column is non-missing, i.e. only the values in C.
Lumi is a new contributor. Be nice, and check out our Code of Conduct. Not the answer you're looking for? Browse other questions tagged r ggplot2 glm predict or ask your own question. How to plot predicted probabilities from a GLM with 2-column matrix response? 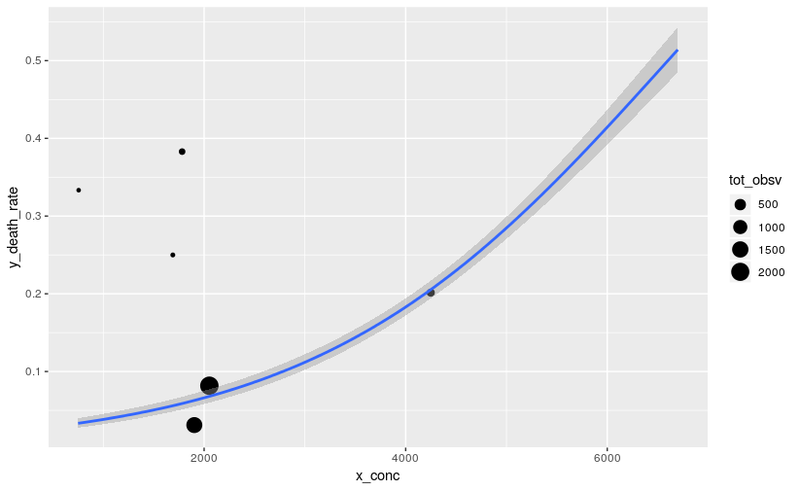 R loess prediction does not match ggplot geom_smooth(). Error in my prediction formula?